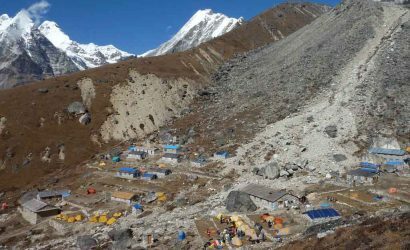 The Gokyo-Renjo La Pass trail is considered as an alternative trekking route to the traditional Everest Base Camp trek. Renjo la pass gives an alternative way to the Gokyo trek making a circuit. 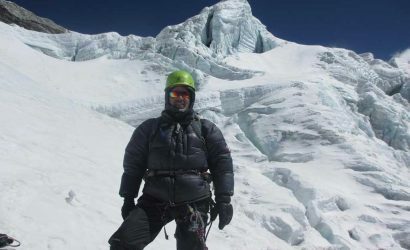 This is a less crowded popular adventure trekking available in the Everest region. We spend two nights in Namche Bazaar for better acclimatization. 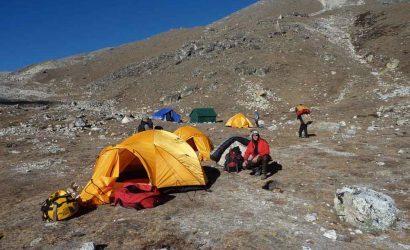 We will also make some excursions to the surrounding legendary Sherpa villages before heading off to the Gokyo Valley. Breathtaking mountain vistas are complemented by visits to the Sherpa villages, homes and monasteries. 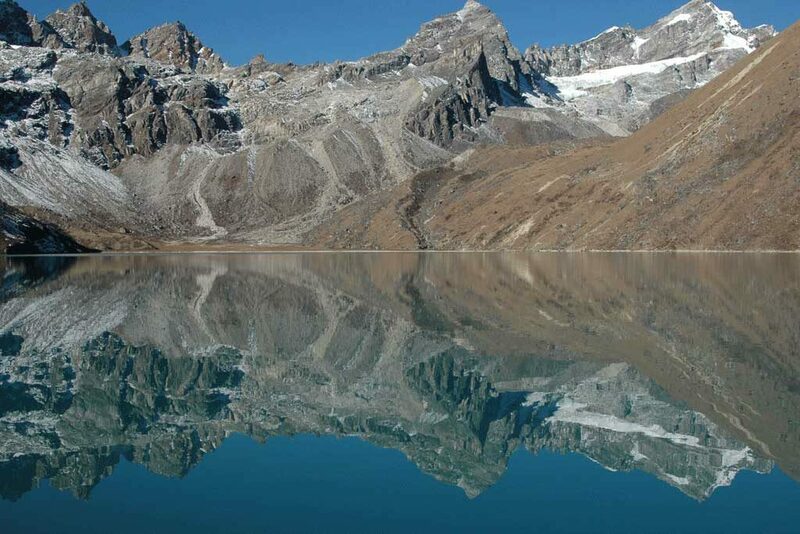 One of the highlights of this trek is the Gokyo Lake that lies at the west of Everest Base Camp. 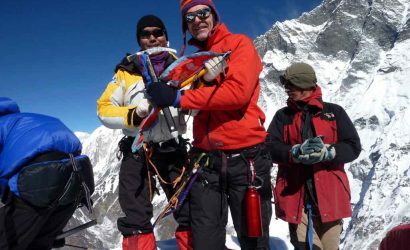 The summit of Gokyo Ri (5,360m/17,586ft) provides an excellent opportunity to see the world’s highest peak, Mt. Everest (8,848m/29,028ft) and the 6th highest peak, Mt. Cho Oyu (8,201m/26,907ft) at a closer distance. Therefore, Gokyo Ri refers to as the best view point in the entire Everest Region for more spectacular views than that from the Kalapatthar. Additionally, an excursion to the fourth and fifth lakes would be a bonus attraction for interested trekkers. Then the trek continues over Renjo la pass and we arrive at Thame, yet another popular Sherpa settlement. Renjo la pass provides a lifetime memory of panoramic views of the Everest Himalayan range. Finally, we end our trek at Lukla waiting for a scenic flight to Kathmandu in the next morning. Today we stay in Namche Bazaar for acclimatisation. Because of the altitude, it will be necessary for us to spend a minimum of two nights here. On this day, we have the choice of just relaxing and roaming round this interesting hill town, or alternatively trekking round a nearby 3-4 hour circuit with stunning views. On this excursion trek, we pass through two traditional Sherpa villages Khumjung (3,780m/12,402ft) which has a chorten at its entrance and Khunde (3,841m/12,602ft) where there is a small hospital. This day helps a lot for acclimatisation for our further trek to Gokyo and Renjo La pass. 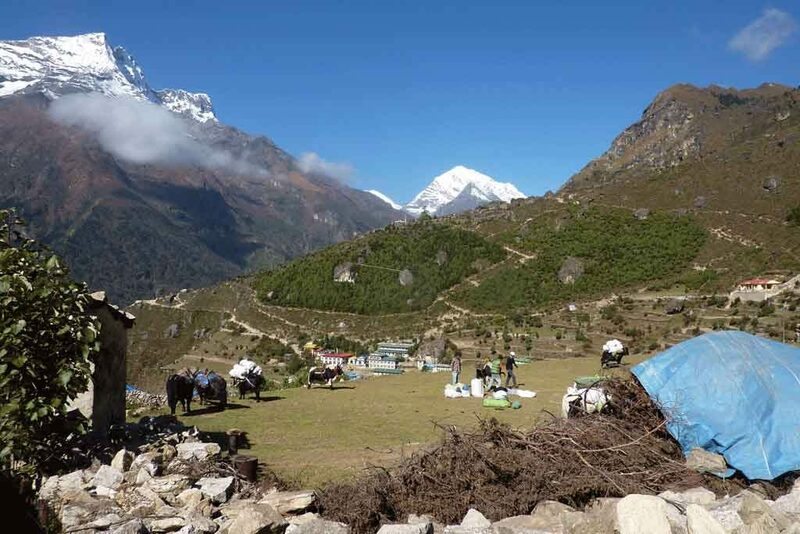 Today we will soon reach the small ridge-crest settlement known as Mong (3,973m/13,035ft) the birthplace of Lama Sange Dorje, who allegedly brought Buddhism to Khumbu. We now enter the Gokyo valley and descend about 300 meters in a series of zigzags to reach Phortse Tenga (3,680m/12,664ft) which has a few basic lodges. The trail now climbs through rhododendron woods and comes to two outpost buildings (National Park and Nepalese Army), a point from which, for the first time, we will be able to see Cho Oyu (8,201m/26,907ft) at the head of the valley. The route now makes twisting ascents through woodland, climbs more steeply into the open, crosses a number of streams, traverses a yak pasture with a solitary herder’s hut, crosses a minor ridge and enters our overnight stop, the lodge settlement of Dole. Dole began as a kharka (a yak pasture) with a few herders’ huts, but once Gokyo became a trekking destination, lodges soon blossomed forth. Trekking time 6-7 hours. Trek Gokyo to Marulung (4,210m/13,813ft) crossing over Renjo la pass (5,340m/17,520ft). Today we start our trek at dawn and reach Marlung crossing over the Renjo la pass (5,340m/17,520ft). It is a long day trek and we have to arrive at Marlung for overnight stay as there is no alternative in between the trail. We trek down from the Gokyo Valley, leave the main trail and turn towards Renjo la path. In about three hours trek, we reach the Renjo la top. 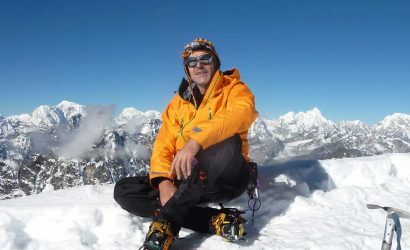 The stunning views of Everest, Lhotse, Cholatse and Taboche are unforgettable from the top. Views from Renjo la are much similar to that from Gokyo Ri. Continuing on from the pass, the trail goes down to Marlung on the east bank of the Bhote Koshi. We stop at Marlung for overnight halt. Trekking time 7-8 hours. 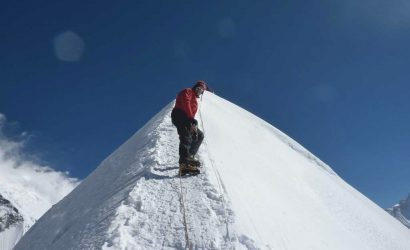 Trek Marulung to Thame (3,820m/12,533ft). The trail from Marulung to Thame follows a traditional route used for centuries by the Tibetan traders. We cross the Bhote Koshi down from Marlung and descend to Taranga. 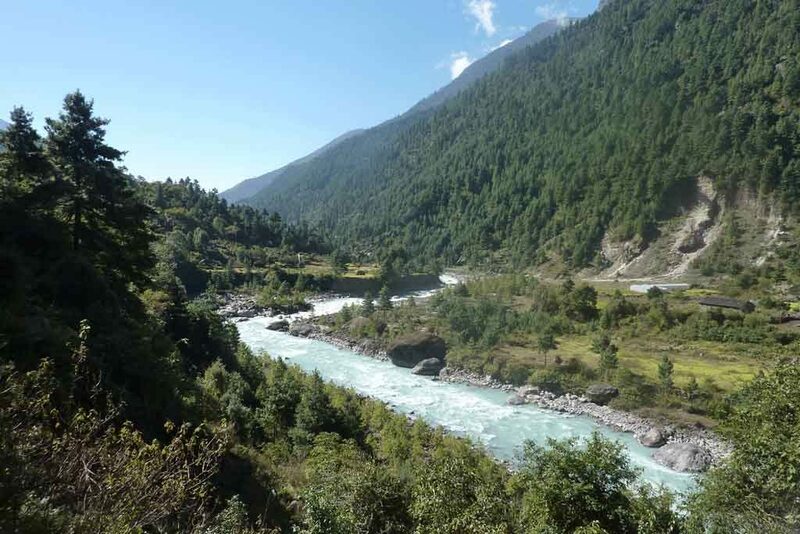 The trail then goes through the valley of Langmuche Khola (River). Thame has an extensive village with a few lodges and stunning mountains such as Thamserku, Katenga, Kusum Kangaru, etc. Thame has a famous Gompa, established some 325 years ago and has three big images of Chenresig (Avalokiteswara), Guru Rimpoche, Buddha Sakyamuni. Colorful Mani Rimdu festival is celebrated featuring colorful mask dances in this Gompa every year in May. We stay overnight at Thame. Trekking time 5-6 hours. Trek Thame to Namche Bazaar. Today we continue our trek to Namche Bazaar. After passing through a check post, we come to the world's highest hydroelectric power station and this station provides electricity to most parts of upper Khumbu. We eventually reach Namche Bazaar again through some Gompas, colorful player flags, Mani walls and Chortens. We stop at Namche Bazaar for overnight rest. Trekking time 3-4 hours.